*DIRECTV Local Authorized Dealer! "WE COME TO YOU" for all your Car Audio,Wheels & Tires,Cellular Phones,Furniture & More Needs. BRINGING YOU QUALITY! We value our Customer's Satisfaction by taking the hassle out of the installation process by meeting our customers when and where it is most convenient for them. We have mobile units to service your needs at any location so you no longer have to wait around wasting your valuable time. We provide ONSITE INSTALLATION in every type of vehicle. We specialize in sales and installation for any vehicles. You can provide your OWN MERCHANDISE or PURCHASE DIRECTLY FROM Ask D Audio. Pickup/Drop-off services of vehicles are also provided, please call to make an appointment. Wheels & Tires Packages!! 30" $3850.00, 28" $3050.00, 26" $2450.00, 24" $1950.00, 22" $1450.00, 20" $1250.00 *(Wheels & Tires Same Day Installation). We also offer a 10% Price Match. We will not be undersold by anyone. We Offer High End Car Stereo,Speakers,Amplifier,Car Alarms,TV'S,Camera's,Cellular Phones,Wheels & Tires & WINDOW TINTING, FURNITURE & MORE.. *Store Hours (MON-SAT) 9:00am-7:00pm (SUNDAY)APPOINTMENTS ONLY! 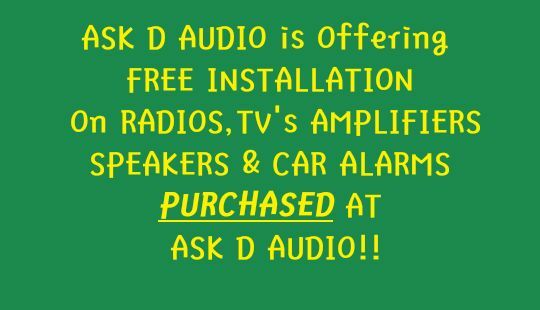 Ask D Audio,Furniture & More... is located at (3100 U.S. HWY 80 WEST Phenix City,AL 36870). For Directions or Questions Call (904)803-0795. For more information give us a call or visit our FAQ Page. So shop with us and start saving now because "QUALITY does not have to be EXPENSIVE" Unlike Others,We don't promote "Clout and Prestige" through high prices,for our top of the line products. We price them right while "Bringing You Quality Sound" and let you be the judge.